Our customers have commented on how easy the kiosks are to navigate around. 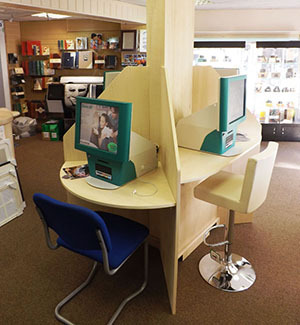 Although these kiosks are easy to operate, we are at hand to offer help and assistance when required. There are three kiosks where you can sit to operate and choose your prints. One area has been thoughtfully designed to enable easy access which would also accommodate wheel-chair users. Our new instant printing Kiosk can produce good quality 6x4 & 7x5 prints while you wait. You will be able to do a number of alterations to your images-zoom and crop, turn the image into Black & White/Sepia, add text, plus many more. Depending on the size of the order the prints are ready within Two minutes. This kiosk will also produce CD's from your media.